DESERT HOT SPRINGS, Calif. - It's only a few turns on the map, a mere 15 minutes down the road. But it isn't long after you've pulled into the long driveway of Desert Dunes Golf Course that you realize this is a completely different take on Palm Springs golf. Desert Dunes is wide open, except for those hulking, monster bushes lurking. Desert Dunes Golf Course has a unique layout that combines a traditional links design with true desert-style golf. The course winds through natural sand dunes that are accented with mature trees and an abundance of native vegetation. It offers one of the most challenging rounds in the valley with narrow fairways, dramatic elevation changes, and fast, sloped greens. The mammoth clubhouse looks like somebody's 1970s ski lodge, but there isn't another building around. As far as the eye can see. That isn't just unusual in Palm Springs golf. It must be against the golfing mecca's charter. The Palm Springs valley all but abandoned its desert habitat in its golf-course construction. It's all beautifully green, clean, mountain-shadowed courses laid out in grandma and grandpa's front yard. This Robert Trent Jones Jr. design has enough desert vegetation to make you think they injected steroids into these bushes. They're thick, thorny, twisty, rocky, sanded monsters that seem to feed on golf balls. Your golf balls. Those precious Pro V1s that can have you sounding like Gollum in The Lord of the Rings. Those cheapies you bought at Wal-Mart. Doesn't matter. If it's white and dimpled, Desert Dunes wants it. There are so many golf balls buried in the bushes at the turn of the dogleg-left 406-yard par-4 No. 4 that it almost looks like a thorny museum. Reaching in for them is a fool's mission, however. These are nasty bushes. Penalizing bushes. "It's a different experience than you see in a lot of Palm Springs courses," said Mark Tansey, president of the Sunrise Golf Co., which runs Desert Dunes. "It's very desert, very clear." Playing Desert Dunes after swinging away with impunity on a run of traditional Palm Springs tracks can be like getting a cup of cold water thrown in your face while you're sleeping. It's not necessarily pleasant. But that doesn't mean it's not invigorating. Your focus tends to sharpen if you know a shank is going to get swallowed by that Little Shop of Horror plant's uglier cousin. Which doesn't mean all of Desert Dunes is a chore. Far from it. "It's drivable," Vancouver golfer John Purcell said. "You can really go for some of the greens." Seven of the 10 par 4s come in at under 410 yards. The 586-yard, par-5 13th is the only really borderline mammoth hole. There are fun, entertaining holes. No. 5, a 176-yard par 3, throws a huge desert clear area in front of a small fairway/green area flanked by some of those sinister bushes. On the days when the mountains that loom in the background are covered in snow, it's a breathtaking hole. Made all the better by the fact that your group's going to be able to experience it on its own. The holes are nicely separated on Desert Dunes, especially on the front nine, giving you a sense of isolation. The silence drops in so unexpectedly, it's like a long-lost friend suddenly reappeared and you've just realized how much you missed him. Well, unless you hear somebody curse about the sandy, uneven greens. This is Desert Dunes downside - no small one when you consider how much putting can affect your take on a course. "It's got those sandy, aerated greens that are a pain," Purcell said. "The greens are the only thing that takes away from it." 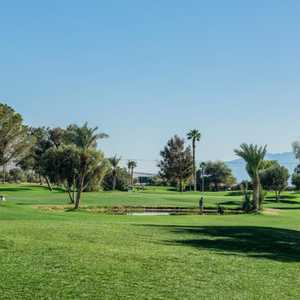 When Desert Dunes is charging an almost unbelievable Palm Springs bargain -- $49 green fee around the holidays time -- the shaky conditions of the greens are much more easily forgiven. Still, the "Top Conditioned Course in the Coachella Valley" blurb on its brochures (and repeated by Tansey) seems a stretch as you near the hole. These were the worst greens I played in an extensive Palm Springs-area golf trip. They do improve towards the end of the round, just in time for the closing stretch of 15 through 18 that showcases Desert Dunes at its best. No. 16 is a great framed hole. This 530-yarder doglegs right along a sizeable lake that completely obscures the tucked-away green from your perspective on the tee. Decision time comes on both your tee shot (how close do you dare go right, the straightest path to both the green and the water?) and your second (cut the corner on the protruding lake or play it safe?). Once you get to the green, you find one of Jones' undulating tests, with cactus standing sentinel all around and a two-level waterfall. Look closely in the rushing waterfall and you're liable to see some big carp swimming by. "We've had golfers ask if they can fish out of there," Tansey said, laughing. It's not fishing to suggest that Desert Dunes is one Palm Springs valley course that will not blend in with the others. Call ahead and ask about the conditions of the greens - the staff seems more golfer-friendly than most - and then book your Desert Dunes round. Even with the greens sandy and rough it's worth playing, if only to get a taste of the actual desert in the desert. This isn't one of Robert Trent Jones Jr.'s trophy-piece designs, but he does manage to pull off an almost links-style feel by relying on those thick bushes rather than trees. The par-5 first gets you started on this path with a succession of rolling hills. This is one of the narrower fairways on the course and a good wakeup call. Desert Dunes is no pushover. Its course record is only 65 (despite hosting a bunch of PGA Tour qualifying tournaments), and its 142 slope rating is anything but an illusion. If the wind kicks up, as it often does on this open course, it can morph from tough to brutal. Yet you'll likely have fun with some of the punishment. No. 17 has a bush so ridiculously thorny that even the biggest ball-retriever-gadget geek tends to leave those wayward shots untouched. No. 18 has three small boulders in one bunker and a pot bunker so steep you'll be talking about the escape all through beers if you pull it off. Just another day of Palm Springs golf? Not by a thorn shot. I played this course last year and shot an 86, which I guess isn't too bad for an 18 handicap. I will agree, though, that those bushes are voids of "no return". #16 is the most picturesque and is difficult too. I hope to play it again this year when I come down.